Ok, so we all know that this isn’t really true. Even Reese Bobby later recanted his famous phrase. However, this does have some application for the Michigan State Spartans heading into 2015. In the last three years, the Spartans have won a conference championship, a BCS bowl (R.I.P.) and a New Year’s Six Bowl. The only thing they haven’t done is compete for a national title. This year will be one of the best opportunities Mark Dantonio has had to get there in his nine years, including the upcoming season, in East Lansing, too. So, no you may not be last if you aren’t first, but being first is about the only think this Michigan State team has left to accomplish. 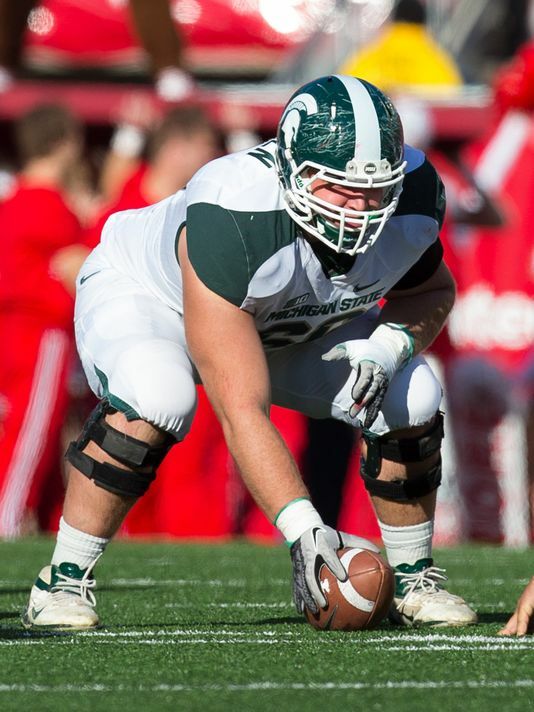 If the Spartans have one offensive advantage over their division rival Ohio State, it’s the offensive line led by All-American center Jack Allen. He isn’t the only “Jack” on this offensive line who’s a major contributor either. LT Jack Conklin was a second team All-Big Ten pick last season, and some have him on their preseason All-American ballots. The Jacks are joined by RG Donavon Clark who has 19 career starts, and my expectation is that Kodi Kieler and Brian Allen will fill the right tackle and left guard spots, respectively. Connor Cook also showed at quarterback last year, that he can hold his own against either Ohio State quarterback. Cook passed for 3,214 yards last year, 24 touchdowns and only eight interceptions, and this is supposed to be a run-first team! One area of Cook’s game that needs improving though, is his accuracy and decision-making outside of the pocket. Replacing Jeremy Langford and Nick Hill at running back will be the most difficult job Jim Bollman has entering into training camp. From what I can tell, there is no clear-cut favorite at this point, although according to Athlon Sports, redshirt freshman Madre London is the frontrunner. However, my recommendation would be to keep a close eye on training camp, because I suspect that will be an on-going competition right up until week one. 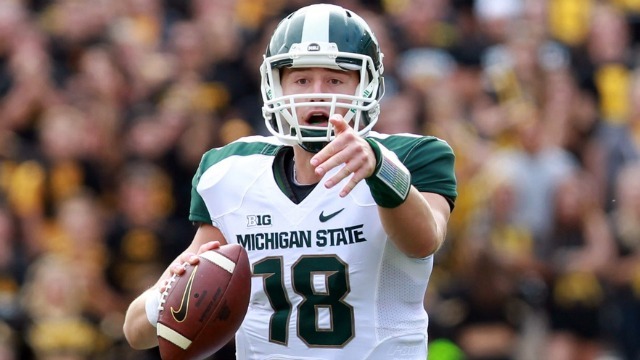 Connor Cook will also have to find a new primary receiving option this year. Tony Lippett had 1,198 receiving yards for the Spartans last season, but will be suiting up for the Miami Dolphins this fall. Aaron Burbridge seems like a good candidate to replace Lippett, as he caught 29 passes for 358 yards as Lippett’s backup last season. The Spartans do still have tight end Josiah Price, who caught 26 passes for 382 yards last season, and ought to be one of Cook’s top targets again in 2015. This is the side of the ball where the Spartans have made a name for themselves under Dantonio. Former coordinator Pat Narduzzi played a hyper-aggressive run-stopping style and dared teams to beat them over the top. Even though Narduzzi left to take the head coaching job at Pitt, don’t expect the scheme to vary much from what Narduzzi ran. Shilique Calhoun is the anchor of this defense at defensive end. Calhoun had 12.5 tackles for loss and eight sacks last season. He’ll be joined up front by returning starters Lawrence Thomas and Joel Heath and stud nose tackle Malik McDowell. McDowell had 4.5 tackles for loss as a freshman last season, and figures to be a more disruptive force as a full-time starter in 2015. Middle linebacker Taiwan Jones may be gone, but opposing offense should still quiver with Ed Davis roaming around at the “Sam” linebacker position. Davis had 12 tackles for loss and seven sacks as the “Sam” backer in 2014. Darien Harris also returns at the “Star” position where he had 37 tackles, an interception and two forced fumbles last season. Riley Bullough will be the man to step up at middle linebacker. 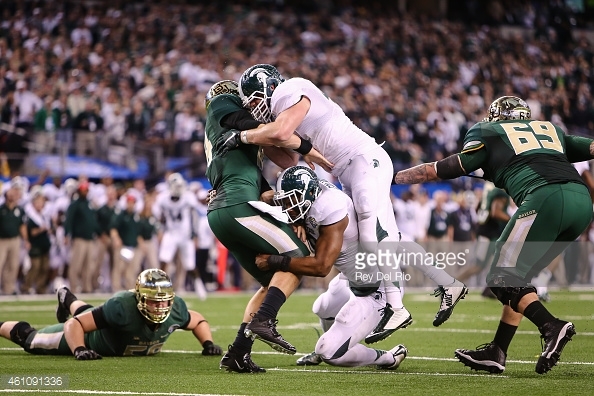 Bullough had four tackles for loss and two interceptions last season. For a team that feasts off of playing close to the line and leaving their secondary on an island, Michigan State will be depending on two unproven corners. Arjen Colquhoun is a senior, but he only had 9.5 tackles in eleven games last season. The other corner will be redshirt freshman Vayante Copeland. Copeland clearly has ability if he is winning the job as a freshman, but it remains to be seen how that ability will translate on the field on gameday. R.J. Williamson is the only returning starter in the secondary at safety. He had three interceptions and five pass break-ups last season, so at least they should have some solid safety help over the top of the new corners. I really like this Michigan State team, but my fear is that their two biggest games are going to end up being poor matchups. If Cardale Jones ends up starting for the Buckeyes, he demonstrated last season that he has no problem stretching defenses with his arm strength. On the other hand, Oregon will be breaking in a new quarterback, but the Ducks always have speed all over the field and that speed could be deadly for the Spartans if their secondary can’t hang with the Oregon receivers. Other than those two games, I like Michigan State to win every other game, but unfortunately they will need to win one or both of those games to stay in the playoff conversation.